Oh MoFo’ers… the randomofo.com feed is like a field of broken MoFo dreams right about now… And yet, there are the brave few who forge on – either after an occasional fall off the horse, or with an unbroken current of blogging enthusiasm. If you’re one of the bloggers who has lost some steam – either give it a go and make a final push, or commit to participating by continuing to comment on the blogs that are still going strong. I have had so much fun with randomofo.com this year – I’ve already got about 20 new-to-me blogs that I plan on adding to my blog roll. It’s so fun to discover the variety of voices and styles and recipes that still exist in the vegan blogosphere. I love MoFo! 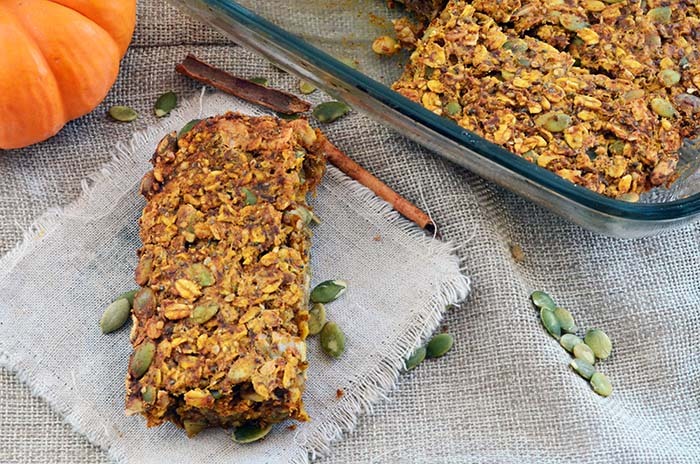 Vegetarian Snob made these Healthy Pumpkin Pie Baked Oatmeal, and I think it looks pretty yum. 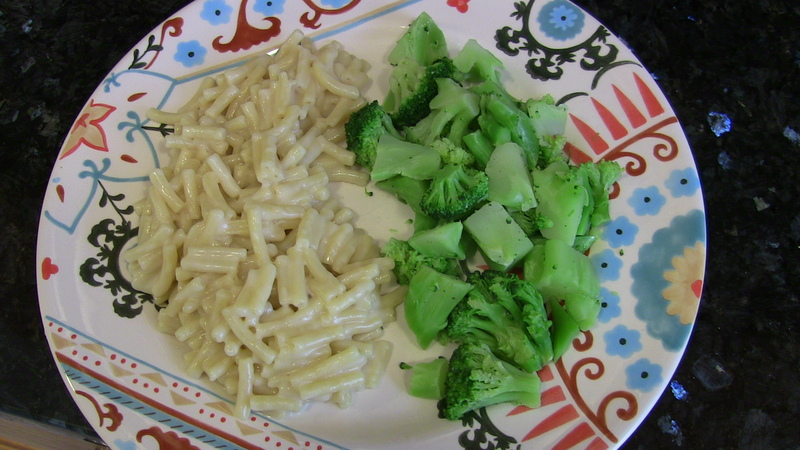 She makes it more on the savory side of things, but suggests that you can add a little sweetener if you like. 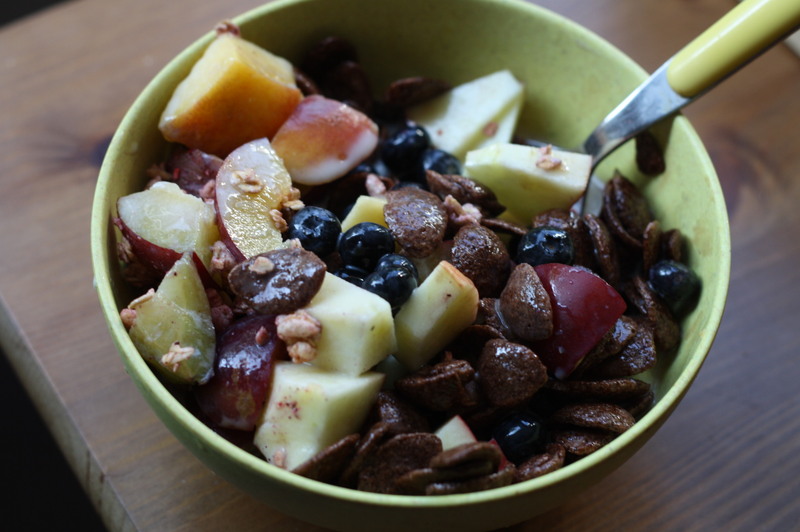 I just discovered baked oatmeal in the last year, and I loved it! I’m still in autumn-denial mode, but once I make peace with reality, I’ll be back for this recipe. The blog New Orleans in Green has been celebrating New Orleans food all month – with everything from famous brands of NOLA goodies to this week’s explorations of culinary influences on NOLA cuisine. 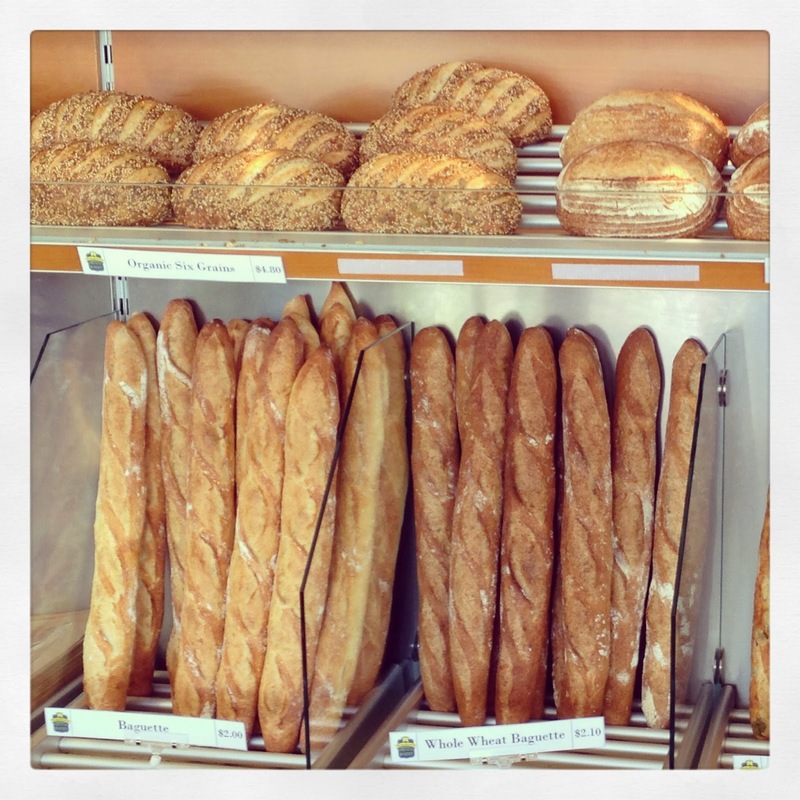 Today’s post is about the lasting legacy of the French in NOLA… including some damned fine looking bread! 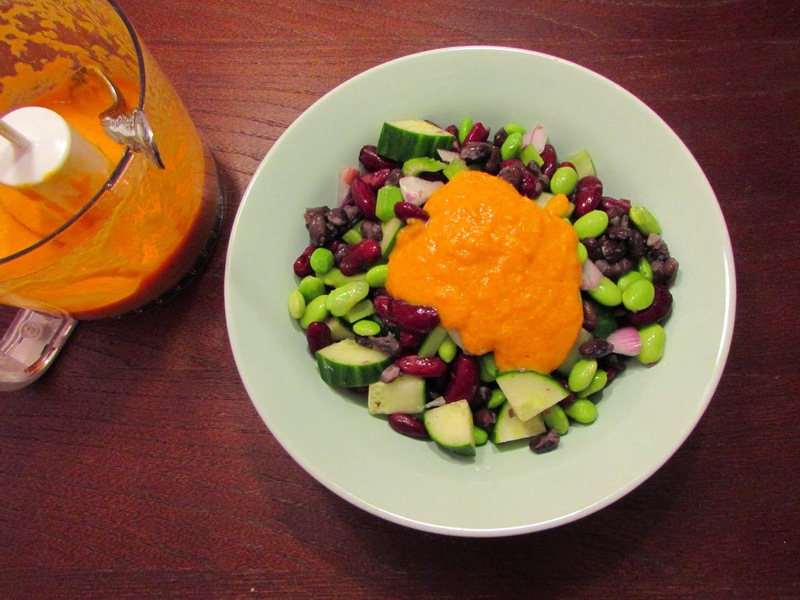 Veg Fiend made this super maximus colorful Carrot Ginger Hibachi Sauce & 3-Bean Salad. The colors are so beautiful! I can’t believe that neon orange dressing – vegetables are so amazing! I’d never heard of Hibachi Sauce, but I think this salad looks great. 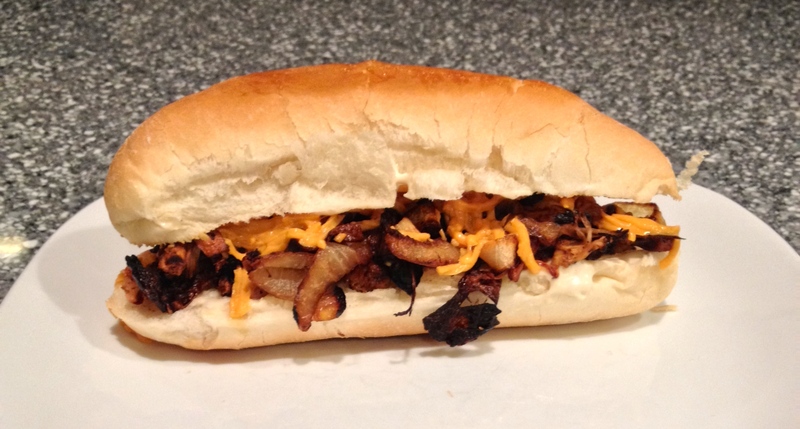 Plus, three cheers to VegFiend for being a non-vegan who is embracing VeganMoFo and doing a great job! I’ve really been loving Vegga‘s “Where Do You Get Your Protein?” nutrition theme this month. 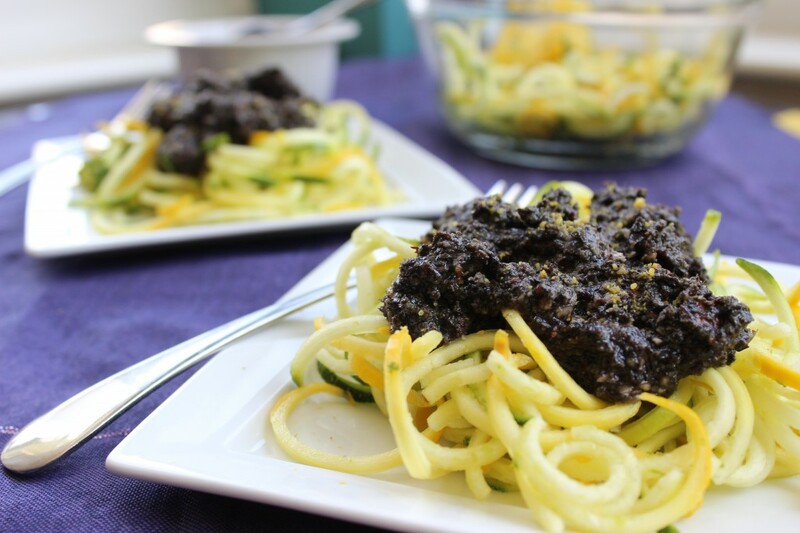 Her blog is doing a most excellent job of demonstrating that eating vegan food can be nutritious, beautiful, and super delicious. 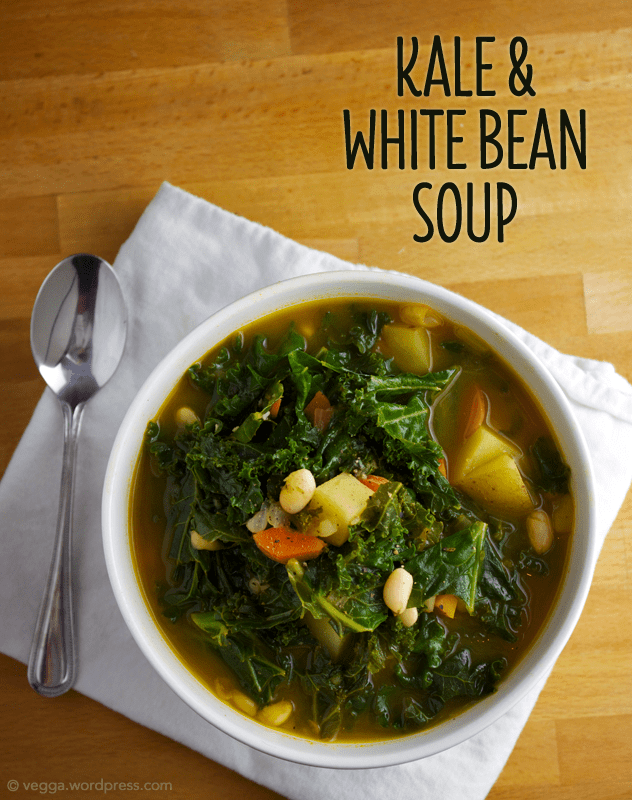 Check out this beautiful Kale and White Bean Soup – it’s bursting at the seams with veggie goodness! 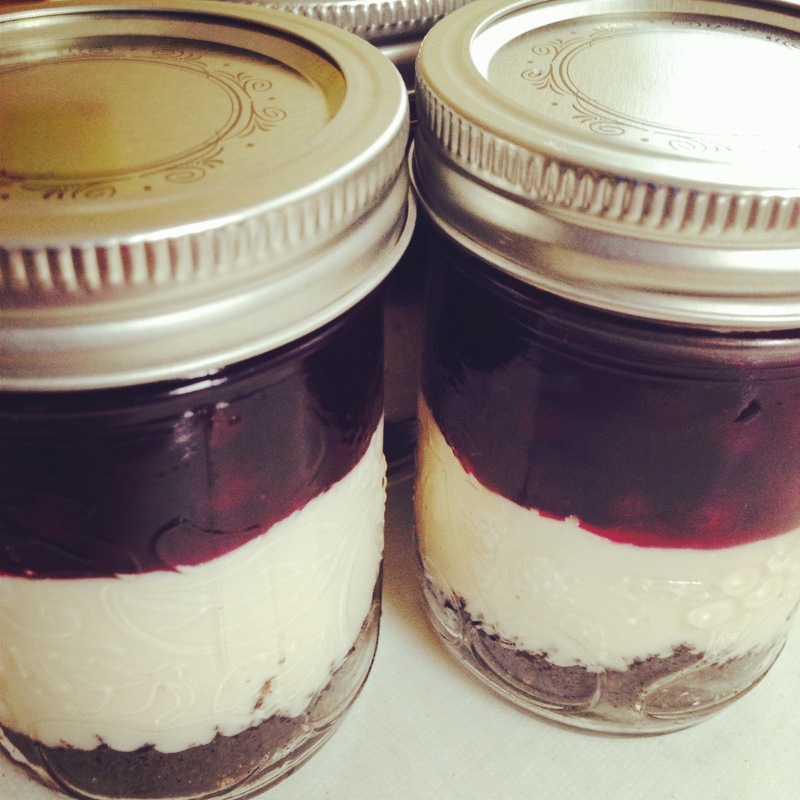 I’ve already bookmarked a bunch of the recipes from this blog so far. Looks like I’m gonna have a lot of post-MoFo bookmarks to revisit. From Veggie To Vegan has been doing beautiful posts featuring recipes from different regions of Italy every day this month. 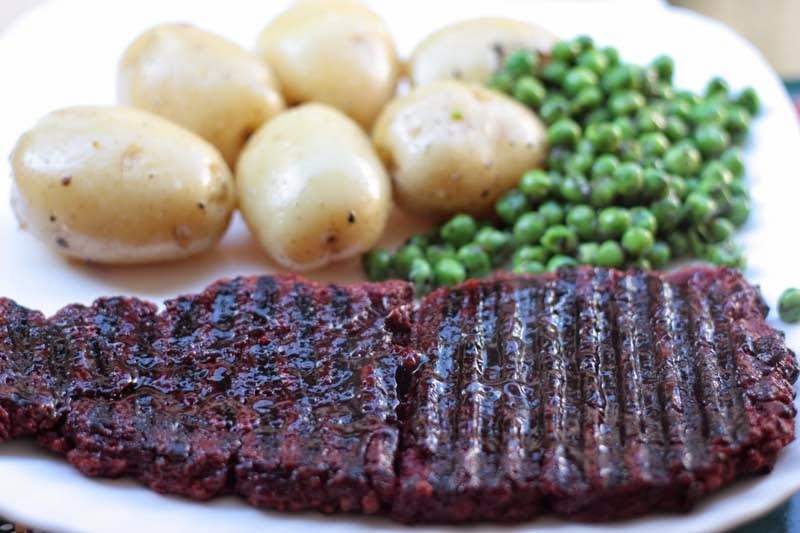 They are so amazing, plus the blog is in German and English – so even more vegans can enjoy these blog posts and recipes. 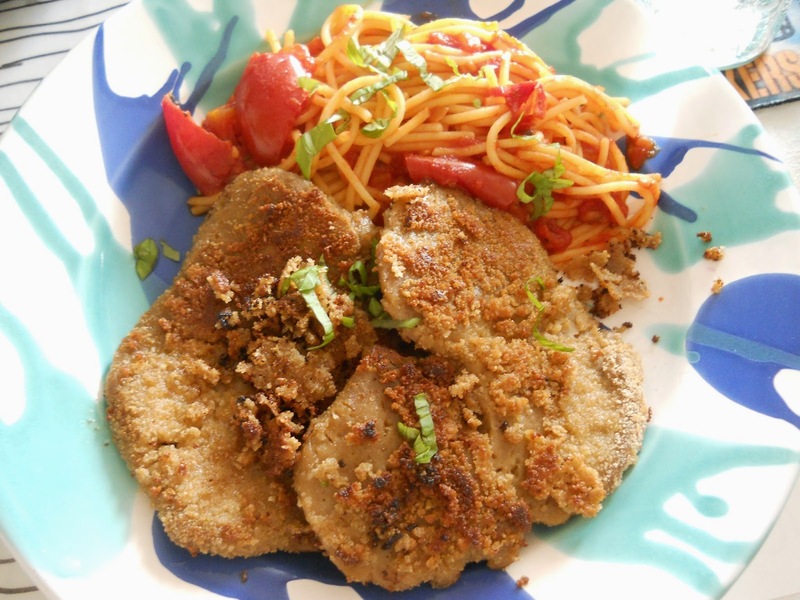 Today’s post is a recipe for Piccata Milanese, from the Lombardy Region of Italy. Doesn’t this picture just make you want to start eating your computer screen? Rock My Vegan Socks (fun blog name!) used purple basil to make Purple Pesto!! I love doing fun and playful things with veggies and this looks so fun. Plus, I have my annual Rainbow Potluck on the horizon, and those purple foods are always a challenge. So, now let’s move on to dessert! Little Vegan Bear has been rockin’ it with a really excellent “Music for Your Mouth” mofo theme – with foods inspired by music. 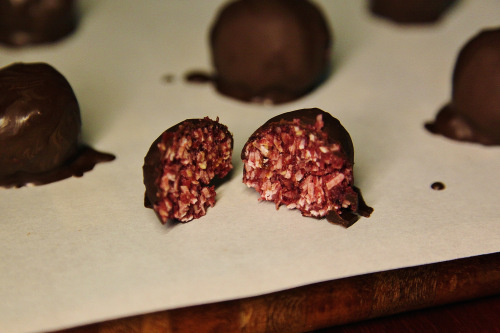 Don’t these Eagle Eye Cherry / Wild Cherry bonbons look delicious? Plus, you get at least one awesome music video every day LVB’s site! 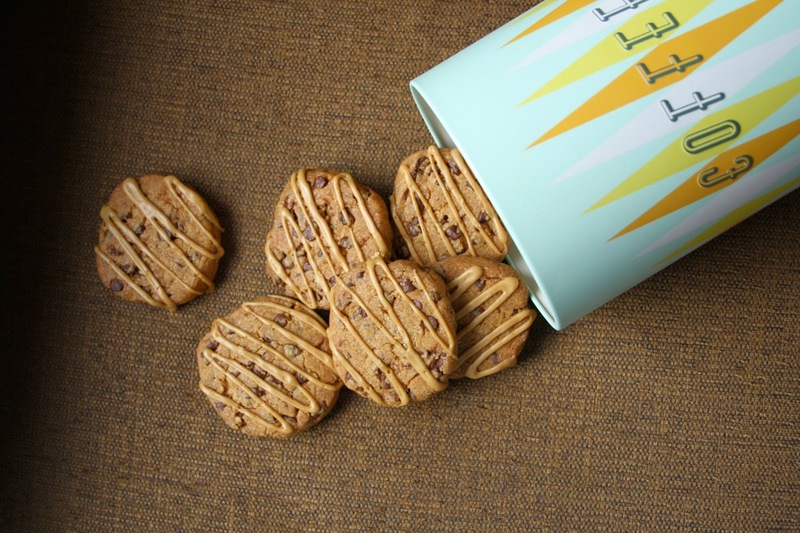 Lisa’s Project: Vegan has been doing daily round-ups on her own favorite recipes, and today’s recipe round-up is all about coooooookies! I am a cookie monster, so this is right up my alley. Plus, I am putting on an event this weekend, so I will be baking cookies all day tomorrow. These Lace Cookies look especially lovely to me. I can’t believe VeganMoFo is more than half over! It feels like it’s only just begun. Maybe that’s because for the first time in five years I haven’t been meeting my post quota. URGH! I’m happy to see so many folks persevering through. Today I saw a theme seem to emerge or maybe I couldn’t help but be struck by all the balls from all over the vegan world. First, is Little Vegan Bear’s Fiona Apple themed Baked Stuffed Apples which look delicious and are stuffed with dates and nuts and all sorts of delicious spices. Every day Little Vegan Bear’s posts are dedicated to bands with foodie names and I am wondering how she keeps coming up with them! Next is VGNGF = VEGAN, GLUTENFREE, DELICIOUS‘s Banana Beignets and Lemon Curd. 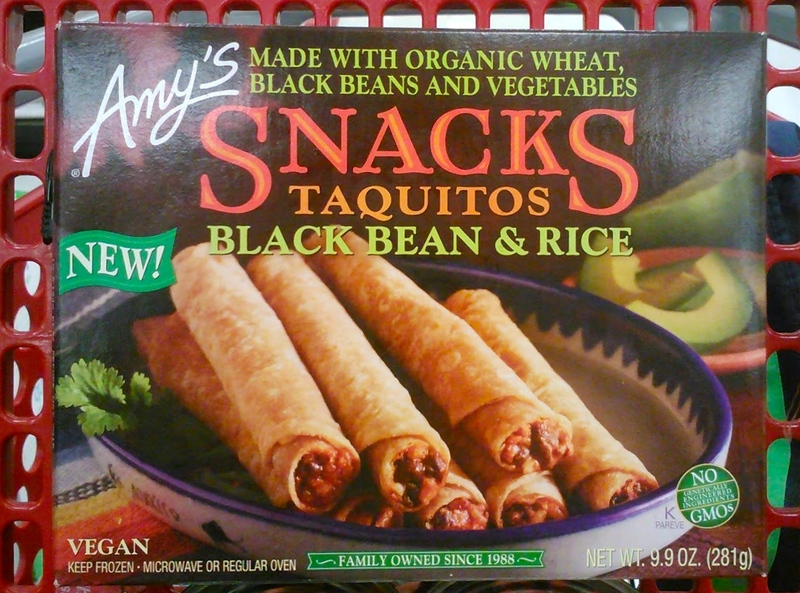 I want to eat every single one of these. They sound so delicious. I also fell in love with the fluffy and beautiful looking Bánh bao chay – Nh? Lan (Vegan steamed dumplings) from Vi?t Nam ?n Chay. It’s amazing how many of my favorite foods are made from just flour, yeast, sugar, and water. 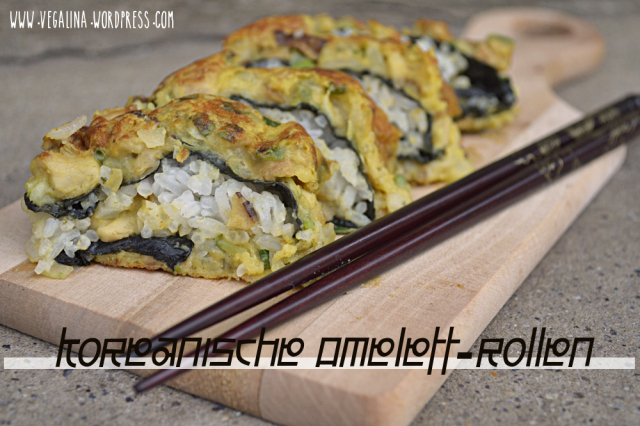 I also saw these Korean omelette rolls (????) from VEGALINA and I wanted someone to feed them to me ASAP. I had to double check that there was no egg because, Jeez, they look eggy. It’s amazing what a bit of turmeric and chickpean flour can do. I bet they tast eggy too with that black salt. I’ve really been enjoying Olives For Dinner’s theme of cooking recipes from Vegan Cookbooks because erinwyso and I seem to have the exact same books! It’s wonderful to see so many of the recipes I’ve looked over come to life in their beautiful photography. Finally, my favorite post I saw today: Smurf Tarts! I didn’t even know this was a thing! I know what my theme is going to be next year! Thanks Fiekefatjerietjes for turning all of us on to this amazing dessert. Don’t worry no Smurf’s were harmed in the making of this post, that’s how vegan we are. Howdy friends! This unplanned Friday round up is coming at you from late Saturday morning in England but it contains Friday’s posts so that still counts right? 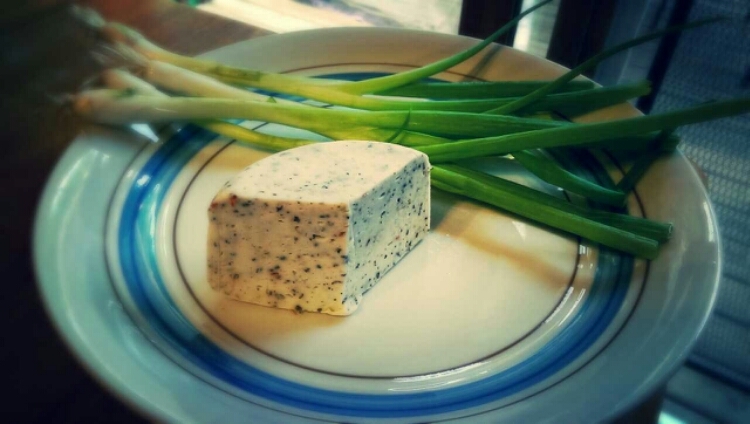 If you know me at all you know that I am pretty obsessed with vegan chesse, if a new one comes out over here I’m trying it. If a new one comes out somewhere else I’ll obsess over wanting to try it until I can eventually get my grubby mitts on it. Hence this round up coming to you from the letter C! I’m not sure which shredded cheese fellow MoFo volunteer Zsu used here in her Premium Patty Melt but gosh darn, it looks epic. I would like someone to make me one of these asap please! 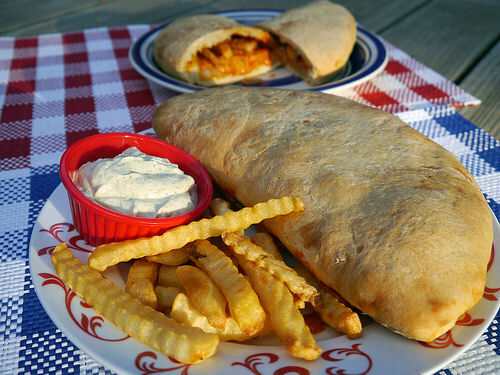 As a huge Parks & Rec fan I have been excitedly devouring Easy Vegan‘s Carb’s and Rec theme and this French Fry Pizza with a side of ranch / ridiculous Calzone post made my mouth water. Want! 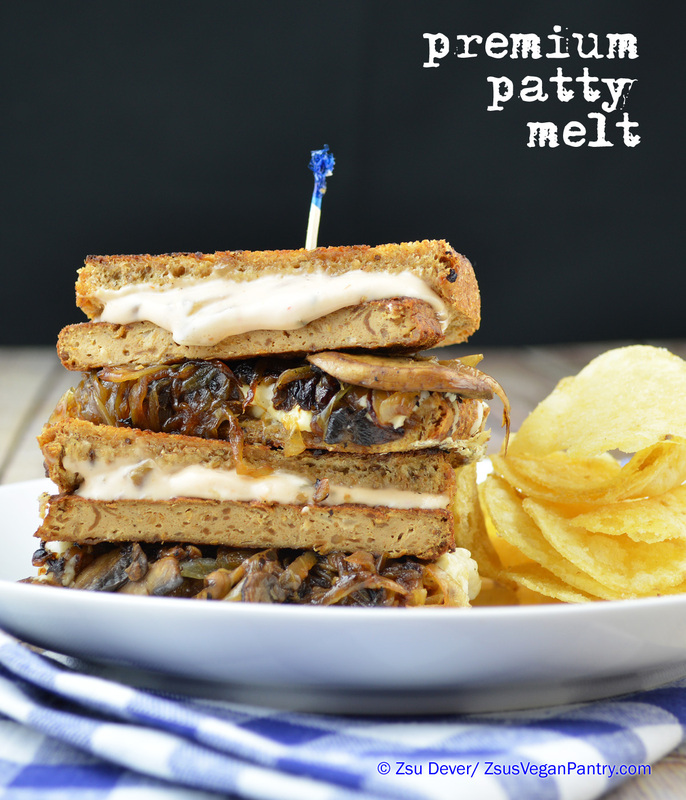 Go to the blog for melty-cheesy inside shots! This next hand held snack is what my dreams are made of! 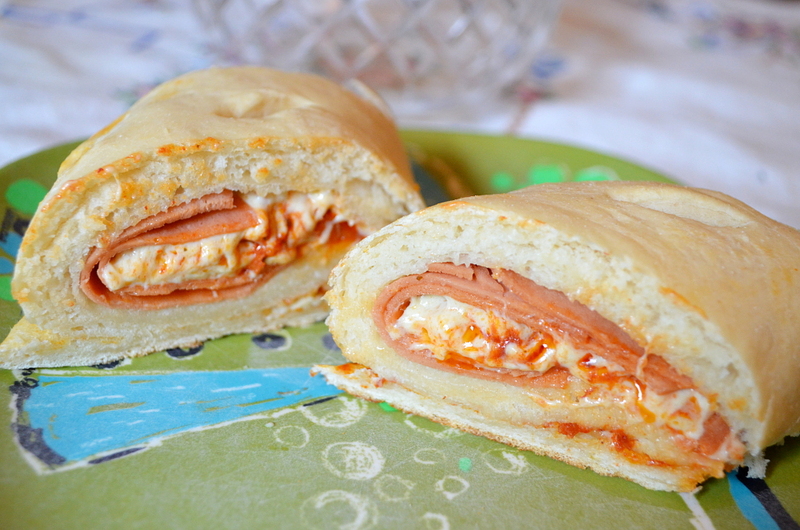 Veganopoulous‘s Ham Cheese Stromboli are made with Daiya and they look like super cheesy, carby perfection to me. 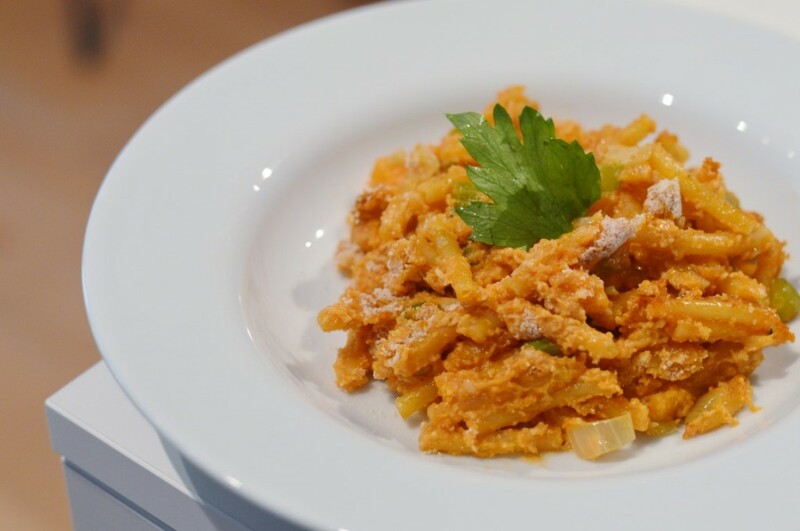 Someone who strayed away from store bought cheese was the blogger behind Avilia’s Way who whipped up some cashew cheese for this delicious looking cheesy pasta dish. 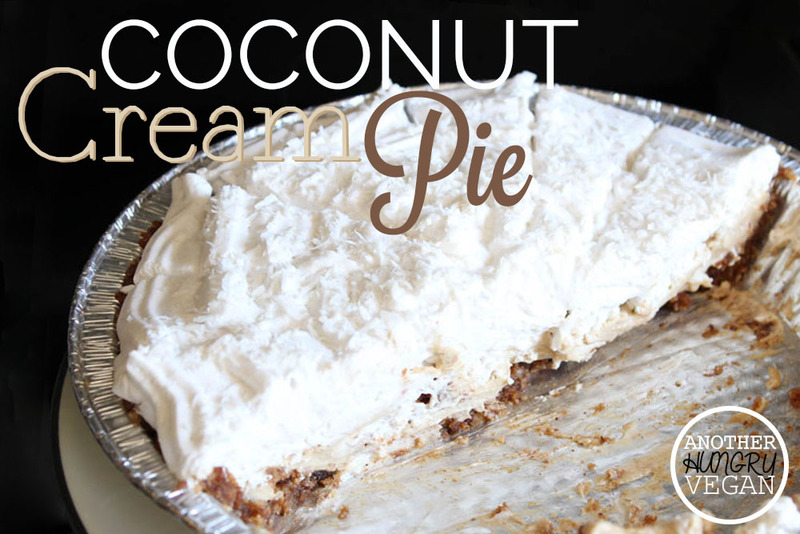 You can totally google translate the recipe if you’d like to make this and don’t speak the language! Next up is another home made cheese from Suzie V Homemaker who used her garlic and Italian herb mozzarella to whip up an amazing looking pizza. Go check it out! It’s definitely poor MoFo form to rep’ your own posts but if it wasn’t meant to be your round up does it count? I hope not! 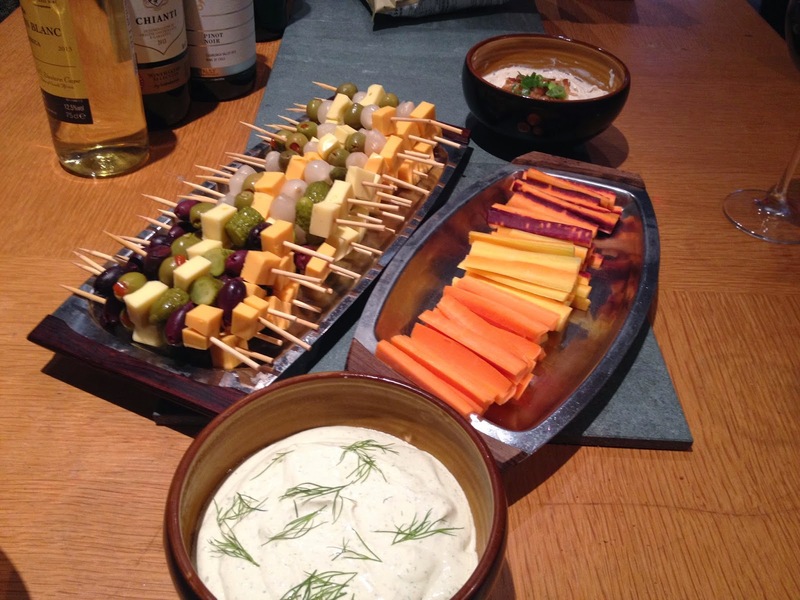 And I hope y’all are as excited about this vegan cheese and wine party (but really, it was all about the cheese. I don’t even like wine!) as I was. These fancy schmancy cheese sticks had two kinds of VioLife cheese, gherkins, pickled onions and two kinds of olives! You can read more about it on vegan.in.brighton. Last but by no means least Loz from In Rad Taste made this delicous looking pizza that I’m wishing I had in front of me right now. 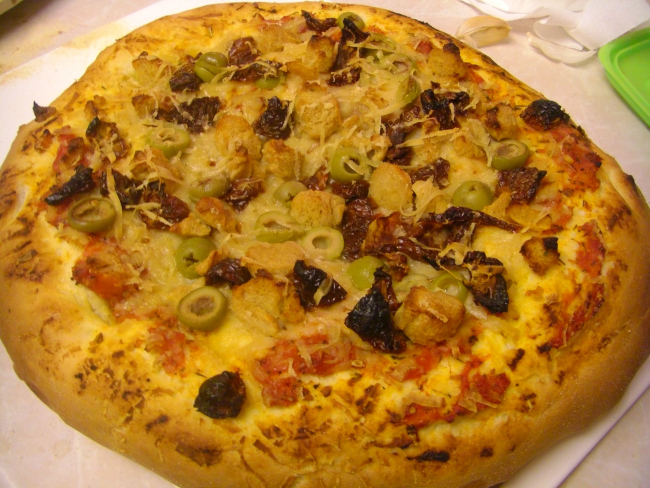 It’s topped with TVP chunks, olives, sundried tomatoes and an unspecified vegan cheese. Let us know what it is Loz! That’s it for this belated Friday round up, stick with us over the weekend as we have giveaways, more round ups and did you see last night’s Chopped post? Ridiculous! I hope loads of you are up for the challenge! 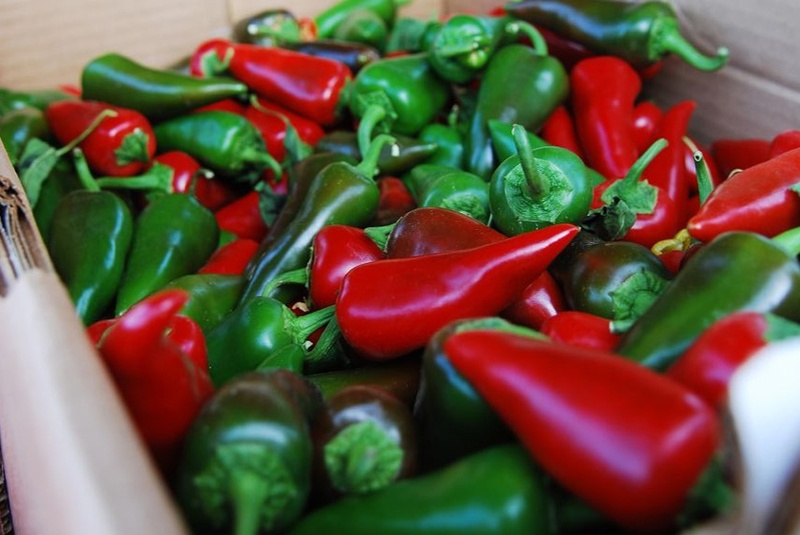 Jalapeños, radishes and … nuh uh, I’m not telling! You’ll have to check this post to find out! Hey there! This is Jojo here, I’ve been on holiday in Austin, Tx for the last 12 days which has meant I’ve had far less time to peruse blogs than is usual for me during VeganMoFo. The lure of taco trucks, friends and the sun all conspired to drag me away from my smart phone. Austin’s beautiful, y’all. I can’t wait for Vida Vegan Con next May! Now I’m home in foggy, chilly Brighton (okay, it’s 17 degrees which isn’t bad but it makes a big change from the beautiful 34 degree weather I’ve been experiencing these past couple of weeks) and I woke up excited and immediately rushed downstairs, fired up my laptop and opened my reader ready to peruse your blogs and get some serious catching up done. I love our Where in the World page and I often browse new blogs by picking a country and reading and commenting on all of the blogs on the list. Perhaps it’s inspired by my love of travel. I think it’s a super fun way to mix it up. Today I picked England because it’s nice to be home. The first post that caught my eye today was this one from Faster, Pussycat! Run! Run! 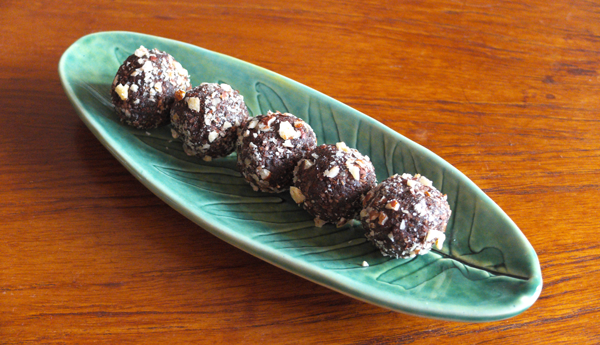 This is a totally new to me blog and these Hazelnut Cocoa Balls are right up my street. Anyone who knows me knows that I love pancakes and these ones from The Grumpy Sailor look amazing. 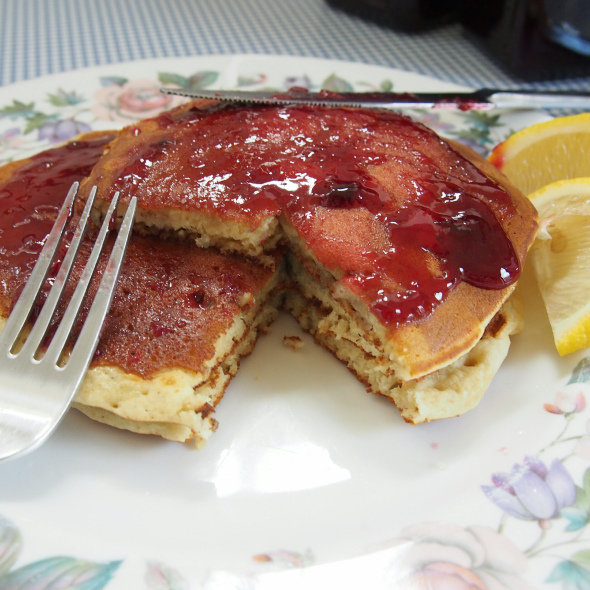 My US pal’s might find covering pancakes in jam (or, as they say, jelly) a little odd but seriously, just try it! This is how I ate scotch pancakes growing up and trust me when I say I will definitely be trying out this recipe. Look how fluffy they look. 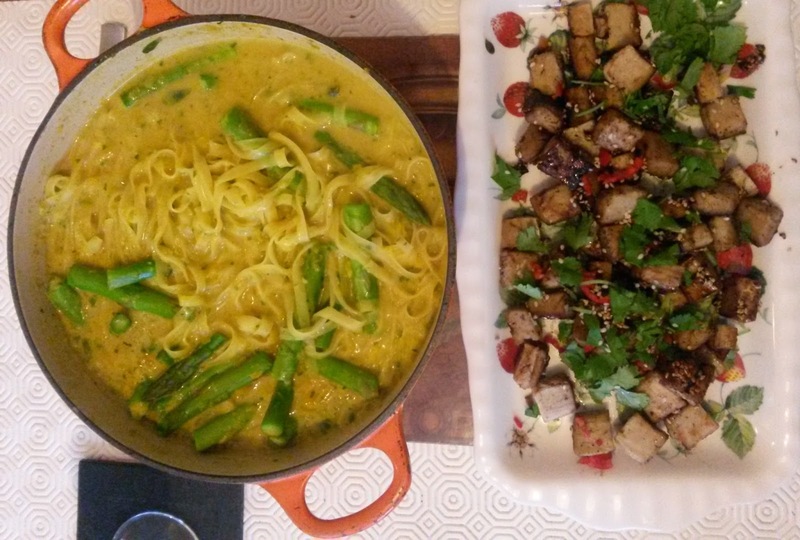 Every Thursday Sal from Alien on Toast is veganising Jamie Oliver’s 15 Minute Meals and today she took on his Thai Chicken Laksa subbing in Realeat Chick’n and leaving out the fish sauce. I love that she’s timing these meals to see how close they come to Jamie’s 15 minute plan! 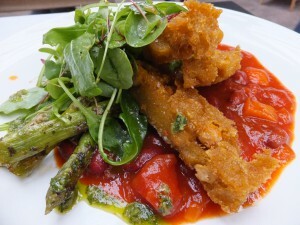 The ladies from To Happy Vegans went to a fancy schmancy vegan pop up dinner at Asparagism together and I have all of my fingers crossed that it returns to London asap. I really, really want to go. The pea shoot salad looked beautiful, the lentil parcel sounded fantastic but it’s this polenta dish that got me all excited. I’m a recent polenta convert and I have no idea what took me so long. Polenta’s delicious especially if it’s battered or coated in something yummy and then fried. This Harry Potter inspired French onion soup comes from the aptly named Miss Kitchen Witch. 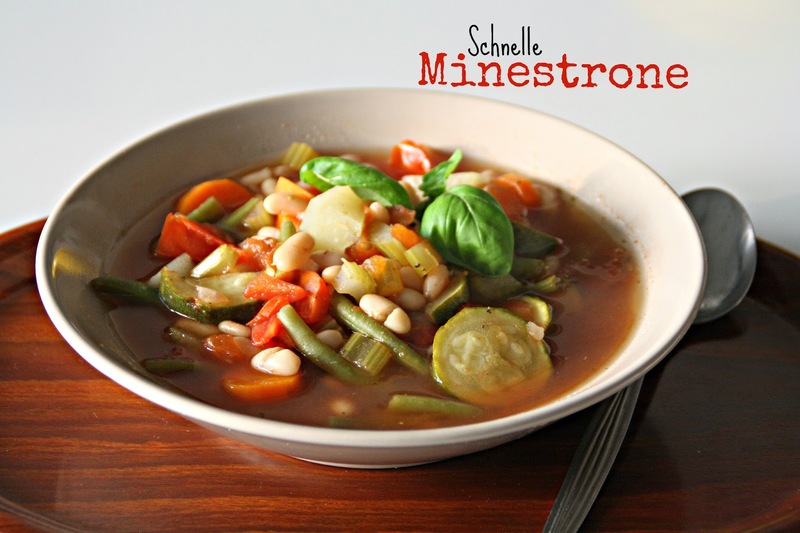 I hardly ever make soup but this one’s tempting me for sure and I love the theme. 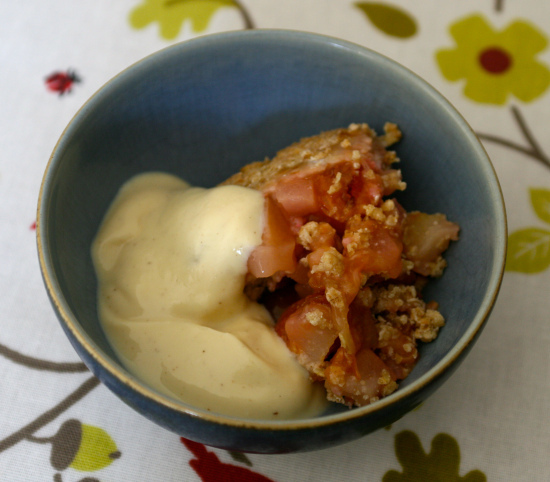 Next up is Welsh Girl Eats who caught my eye with her Plum and Pear Coconut Crumble. I really, really love crumble and one of the things I find exciting about autumn and winter is that it’s crumble season. I usually go for apple but I would certainly be up for throwing some plums in there. Last but by no means least is a post that popped up whist I was writing this round up and I just had to include it. 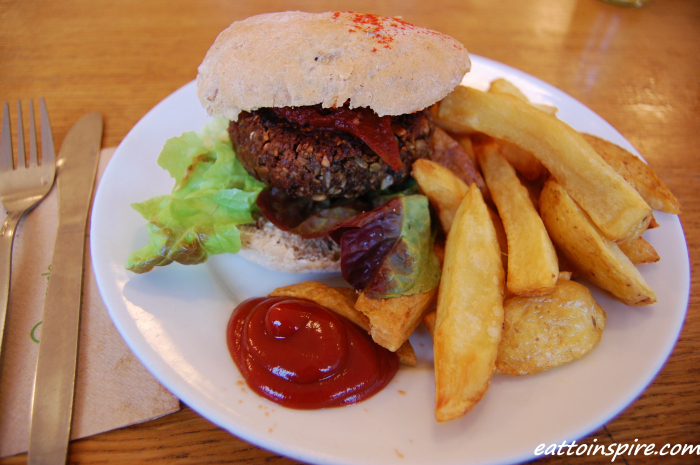 Eat to Inspire posted this delicious looking burger from Cafe Kino in Bristol which was the spot where my husband and I ate lunch just before he proposed to me five years ago almost to the day. Ah, memories. Happy MoFoing everyone. I can’t wait to read more of your posts tomorrow! coming in just under the wire with a round-up for today! One of the things I love most about MoFo is the around-the-world, all-timezones, both-hemispheres aspect of it. When you go on the instagram #veganmofo hashtag, you find breakfasts and lunches and dinners and early spring meals from down under and northern hemisphere folks starting to post about pumpkins and autumn foods. 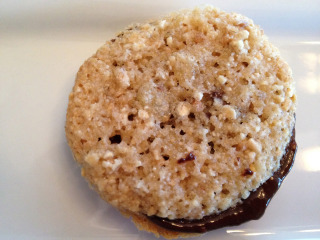 Check out this Macademia Nut Oatmeal with Spiced Brown Sugar from Soy Division. It pretty much looks like the yummiest oatmeal ever. Or, maybe it’s getting to be lunch time where ever you are in the world, and you are looking for something to eat. This Pasta with Swiss Chard and Pine Nuts from One Window Kitchen looks so simple and delicious. And any self-respecting vegan’s gotta already have some pasta and greens just sitting around, right? If you’re in the mood for some serious cozy-time dinner, maybe this nice looking supper of Chickn Noodle Soup with Rosemary Bread Rolls from Stairway to Vegan would hit the spot? She’s got recipes for both! Hasta La Vegan is doing a MoFo theme of using all sorts of wacky old cookbooks and it is SO FUN. Check out this excellent book cover! 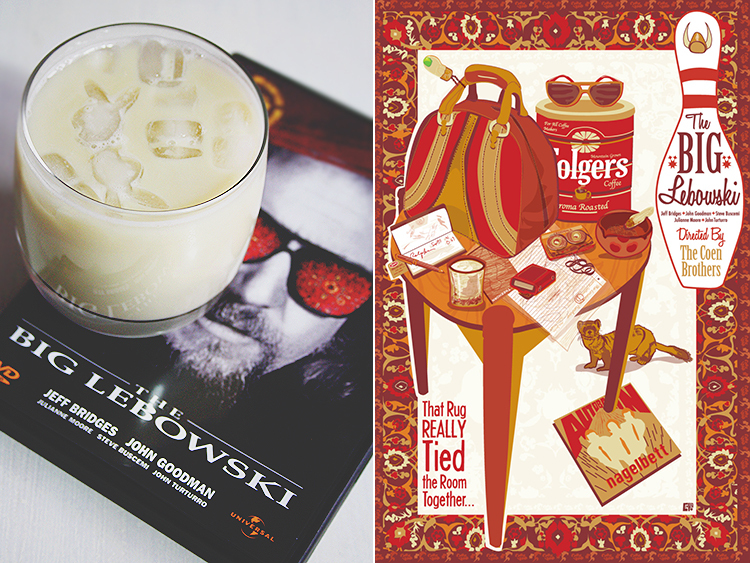 Every day is a different cookbook, with excellent recipes, excellently forthright reviews, and totally great write-ups! I really enjoyed this good-natured, encouraging, and enticing post about How To Make Vegan Pizza from Walks, Talks, and Eats. Pizza is a wonderful spirit-enhancing food, and vegans must learn how to master the art of vegan pizza! Lastly, for dessert, I am going to do something totally uncool and toot my own horn. Well, not really MY horn, but my parents’ horn! 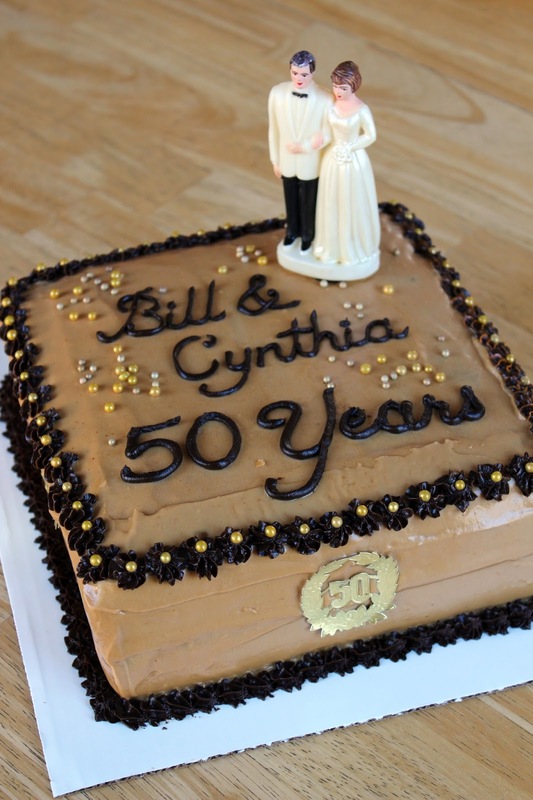 Yesterday was their 50th anniversary and I made them a cake! Three cheers for love!